Paphos has many amenities and activities, including golf, water sports, water parks, diving, jeep safaris, cycling, hiking and even ski-ing in the winter in the Troodos mountains! The town of Paphos has a mix of new and ancient buildings. 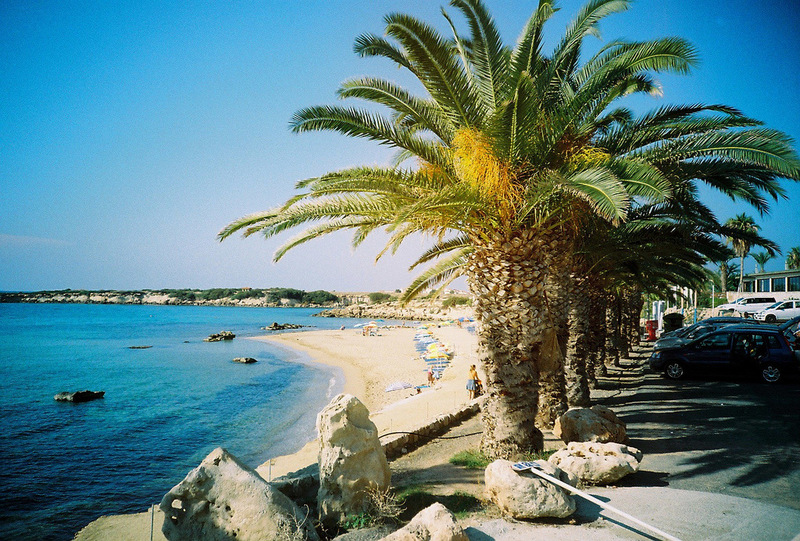 The beach and harbour and port area, known as Kato Paphos, is a hive of activity with many sea-front bars and tavernas. Also here, is the busy Bar Street, which has many bars and clubs for the livelier holiday makers. The Animal Park and Water Park are nearby as are the Tombs of Kings, an archeological and national heritage site. Kato Paphos and Paphos is a 15-20 minute drive from Peyia and there is regular public transport from Peyia to Coral Bay and on to Paphos. Coral Bay Beach Resort, known as the best beach on the south of the island, is a 5 minute drive from Peyia and has many different water sports and activities. There is a busy night life in Coral Bay with bars, tavernas, restaurants and clubs. Peyia is a traditional cypriot village and is only a 5 minute drive from the beaches and resort area. Peyia has many of its own amenities, with bakers, supermarkets, butchers, pharmacies, take-aways, banks, tavernas, bars and restaurants and other interesting shops. The village square includes picturesque fountains and an historic church along with plenty of seating areas, to sit and watch the world go by. Golf, water sports, water parks, diving, jeep safaris, cycling and hiking are all close-by. The Akamas peninsular and forest , with nature,walking and wildlife is 15 mins away. Troodos mountains for scenery and skiing in winter, is approximately one hour’s drive away. 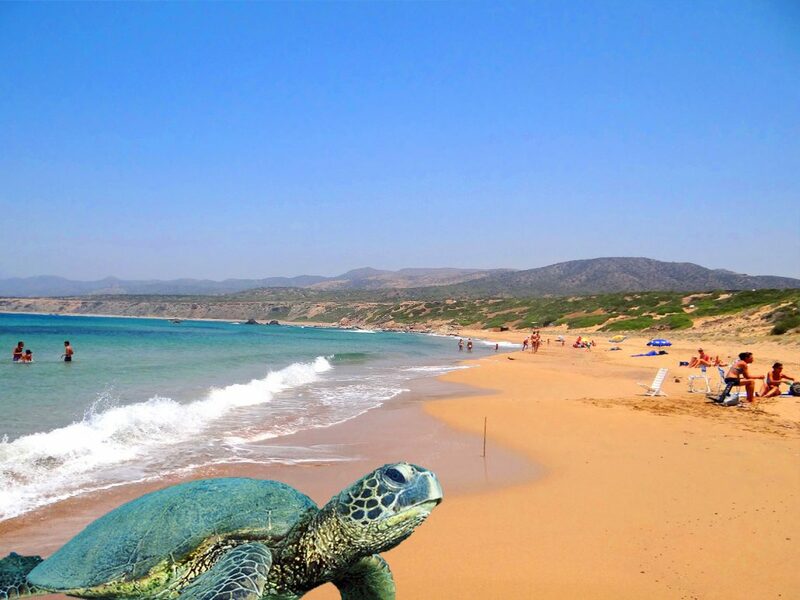 Lara Beach is famous for nesting turtles, which is 10 minutes drive. Latchi is a picturesque, busy fishing town, with its own marina and around 25 minutes to the West. There are plenty of bars and restaurants in the Marina, many specialising in fish dishes. Peyia Municipality includes the beach resort of Coral Bay, the most popular in the West of the Island, as well as the beaches along Sea Caves and onto the Akamas Peninsular, where turtles nest at Lara beach, 10 minutes away. At Coral Bay, sun-beds and umbrellas adorn a safe beach with life guards. There are also ample water-sports activities, from scuba diving to jet-skiing, from paragliding to wind-surfing, only 5 minutes from the villas. Other areas close-by also do rentals of speed boats and pleasure crafts, with the harbour at Latchi on the West of the Island, particularly good. Trips along the coast to the Blue Lagoon and other hidden coves, make a great day out. 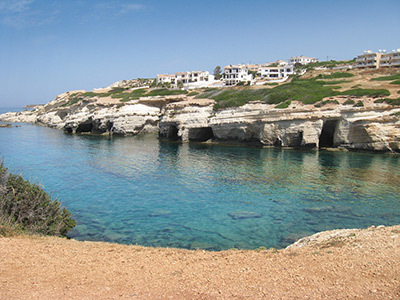 Fly to Paphos Airport – our villa is a less than a 30 minute drive, or fly to Larnaca which is less a 90 minute drive. Flights are available from the UK, using: Thomson’s, British Airways, Ryanair, Easyjet, Jet2 and Thomas Cook from most major UK airports, as well as many other airlines from other parts of Europe with Germania, JetAir Fly, Cobalt, TUI, Wizz, Lufthansa, Austrian and many more. Car hire is recommended and available from the Airports. Car hire is not needed as our villa is less than a 10 minute walk into Peyia centre and there is excellent public transport. Some guests hardly leave the villa. However, if you prefer to tour the island, then a car is recommended. Buses from Peyia to Coral Bay and Paphos and the airport. Taxis cost approximately €40 to airport, again ask for recommendations.